Welcome to Cooking With Cricut's Monday Cartridge Showcase! If you've not joined us before for a showcase and are wondering what it's all about . . . our Designers choose a Cricut cartridge and show you different things they've created. Which we hope will inspire you to get out your cartridge and perhaps use it in a different or new way. Today Chef Olivia is showcasing the Autumn Celebrations cartridge. It is that time again to showcase another fabulous Cricut Cartridge for Cooking with Cricut. One of my all-time favorite cartridges is Autumn Celebrations. I love the Fall and this cart has such great Fall themed images and card shapes! The first up is a Fall wall hanging I did. I had some hay left over from an old scarecrow, so I decided to use that on the border. I cut out the sentiment at 5 inches and used some retired papers I had from CTMH in my stash. The flowers have been in my stash, too. 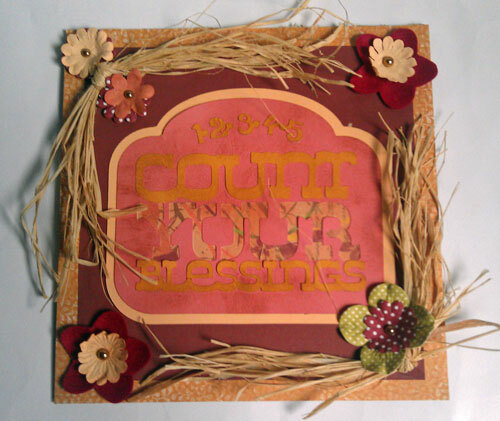 The Sentiment says "12345 Count Your Blessings." The wall hanging is 8x8. Next up is a card I made for Halloween. Though I am not into scary things, I do adore Halloween but more of the cutesy stuff from it. 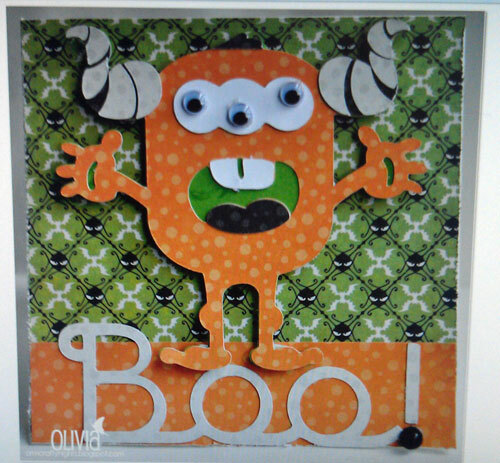 I used a monster and sentiment from Autumn Celebrations. Isn't this one of the cutest monsters you ever seen! The final item is a scrapbook layout of some Halloween and Pumpkin Picking pictures I had of my two oldest children. I used the phrase "Witching Hour" and cut it at 2 1/2" and the other is a tag that says "Trick or Treat". I hope you enjoyed my showcase and thanks for taking the time to see my work. Wonderful projects, Olivia! Each has such wonderful details --thanks so much for sharing them with us! Please head on over to Olivia's blog, ORM Crafty Nights, and leave her some "love" and check out some of her other amazing art work. Make sure you stop back in tomorrow (Tuesday) and check out the newest die cut/stamp challenge from the Paper Crafting World Design Team. The CWC Design Team will be back on Wednesday for their next weekly challenge and Chef Jessica will be sharing the Cricut Baby Boutique cartridge in the Thursday cartridge showcase. You won't want to miss any of the fun! Thanks so much for crafting with us! Wonderful projects! I just purchased this cart so I was thrilled to see some showcased projects.